Just west of Norwegian Trail which is off Town Hall Rd. 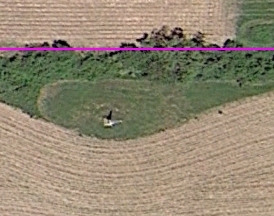 Arial view shows monument just below the section line. The 25 sq. 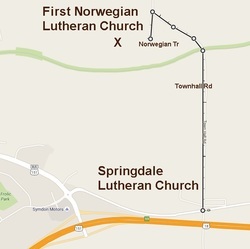 feet of land is deeded to the Springdale Lutheran Church. Notes: This cemetery is also known as the Springdale Norwegian Pioneer Cemetery. It was established in 1847 and dedicated by the Rev. A.C. Preus. 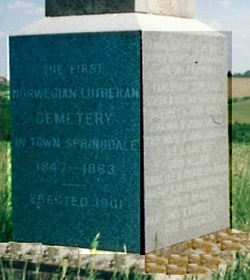 It was last used in 1863 when the Springdale Lutheran Church created a cemetery near the church. The monument was erected in 1901 to mark the location.